Natural wood kitchens are back in a big way, and men the world over (if they gave the subject any thought at all) are probably celebrating. Men love wood. One of my most popular posts this year continues to be The Knotty Pine Problem and 3 Alternatives to Painting it All. It’s probably because so many wives are desperate to lighten up their ’50s-’80s homes with a little white paint, but the man of the house likes it cozy like a bear’s cave. 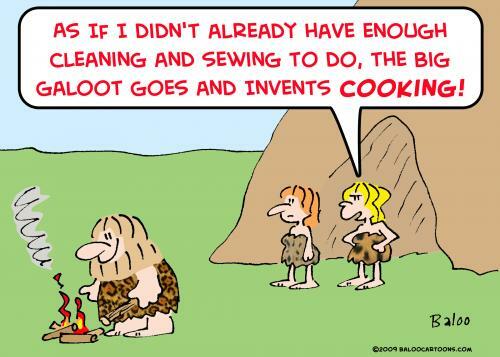 Natural wood kitchens have been around since the Neanderthals pulled up logs to sit on while they cooked their freshest kill over the fire. In the last 20 years, they went out of style due to a glut of bad builder’s grade work. For example, the below kitchen was dated the moment the cabinets were hung. Well, the floors and the lights and the yellow paint don’t help, either. As I detailed in this post, I’ve always be partial to painted kitchen cabinetry and a good dose of color, but many of the kitchens coming up have really turned my head. Perhaps they will for you, too. I think you’ll notice there is one unifying factor in every style — a hefty dose of white! We’ll call it “the fresh factor.” If you want wood, don’t forget the white! Counters, walls, and sometimes upper cabinets. As always, pay attention to the bones of your house before deciding what to do with your own kitchen renovation! These are not necessarily one-size-fits-all. Definitely an upscale look. It works well in some of the high-end new-build homes I am seeing that span a sort of Southern/Craftsman/French look. I think this can also work well in grander home from the early 20th century and certain homes in California, as well. I like the metal upper cabinets and chevron marble backsplash in this one. Feels very patisserie-like. A real Belgian kitchen in Belgium. Sigh…. Cabinetry is still lighter in color, frequently cerused as in the Belgian style, but the cabinetry has a simpler silhouette. Whites in the counters and the walls. Great for modern style homes. The kitchen in Emily Henderson’s first house the way it looked for its first photo shoot. I know she wasn’t crazy about the lower cabinets, which had been sanded and finished, but in the photo, it looks fine. No shiny, orangey varnishes. A rich, medium — not dark! — stain is required! The above kitchen is absolutely gorgeous, but the white trim above the upper cabinets bugs me. Should be the natural wood. Glass front upper cabinet give a more open feeling to a kitchen with lower ceilings. Stunning. 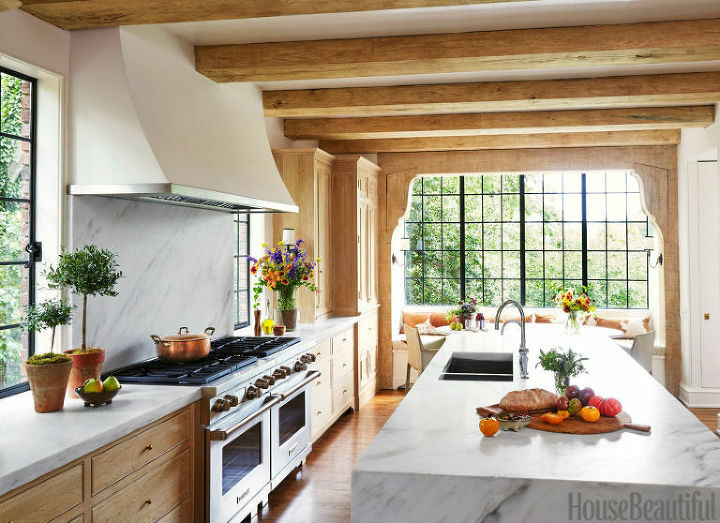 I am in no small way smitten by the beams, plate rack, sliding ladder, the 3 inch marble slab on the island — oh, just about everything. But what if your kitchen dates back to the ’90s or earlier, and your man loves the wood cabinetry that your kitchen already has? This is the type of house I grew up in and probably at least 50% of America currently owns. Ceilings tend to max out at 8 feet and kitchens are comfortably sized, but not ginormous. These kitchens usually need all the storage they can get, so upper cabinets are often a must. Paint just the uppers white. If you can, opt for a white backsplash and counter. All that uninterrupted white keeps your the eye moving up to give the illusion of height. Don’t chop it up with lots of changes in color by using a funky counter and/or backsplash. My own ’90s cabinets would look great with the above treatment. 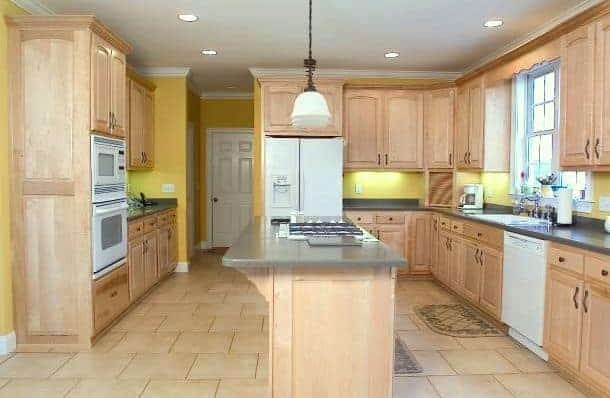 If my kitchen’s layout weren’t terrible, and if my style cabinetry weren’t completely inappropriate for a 1790 house, the above would be an option for me. A little glass in the upper cabinets also adds airiness. Any thoughts? I find myself really loving so many of these kitchens. I still think I will go the painted route for myself — just fits my house and my style — but I think this could definitely be an option for many couples who can’t agree on wood vs. painted kitchen cabinetry.